Don’t Go Where I Can’t Follow takes its readers through the light-hearted joy of a relationship—the comical and touching moments of two young people’s many adventures together—and, eventually, the emotional trauma that accompanies losing a loved one to a crippling illness. The novel manifests itself in varying modes of illustration, through hand-drawn cartoon images and realistic depictions, photographs, scanned copies of actual letters and postcards, and diagrams. This is the record of Anders and Cheryl, a couple who is forced apart by the suffocating grips of cancer, a story of grief and mourning.This work stands as a tribute of that mourning, which is certainly an illness unto itself. Each chapter describes a single travel experience, until the one entitled “Hospital”. Focusing on a painfully stagnant moment, it conveys the physical and emotional turmoil both he and Cheryl undergo once she is diagnosed with non-Hodgkins lymphoma. Anders’s handwriting on a blank page—a shift from the images of various locations we’ve been enjoying—unloads devastating news that unpredictably interrupts their lives. Although the doctor first suggests a splenectomy, Anders only tells the reader of her chemotherapy. This hole leaves the reader curious as to whether the surgery was unsuccessful, perhaps too painful to recall. Through chemo, Anders remains by his fiancé’s hospital bed, and though he sketches Cheryl’s balding, emaciated figure in her hospital attire, this event, as Cheryl says, “you go through alone no matter what” (63). No postcards from trips can bring them together. While Anders never leaves Cheryl’s side, the distance between them far outweighs the thousands of miles that had once separated them. Powerless, Anders confides to his journal that ‘it’s emotionally…draining, frustrating, etc. It’s just too much” (66). At the same time, he says that it is also “very plain and boring. Mundane. Drudgery” (66). Here, the contradictory nature of hospitals is on display. On one side, a hospital delivers bad news; its atmosphere is tense, nerve-wracking. On the other, the majority of the time there is filled with waiting. Anders conveys emotions and thoughts from his cancer-ridden fiancé, who feels, she says, “pushed around, like a chicken”: a verbalization of the dehumanizing process that happens in a hospital (68). Anders’s handwriting becomes increasingly illegible, his emotions shifting from fear and anger to pity and boredom until he scrawls the statement that resonates universally: “Fairness is a human delusion” (69). Following this section is Cheryl’s funeral, written directly to Cheryl, giving her a tour, with painfully detailed drawings of each scene. Although all of her friends attend—far more than she would have suspected—Anders admits the crowds of people would have made her not want to be there. His loss elicits the same feeling of isolation that Cheryl experienced in the Hospital. The reader is placed among the crowd, looking at Anders in the far off distance. Experiencing this excruciatingly private moment, the crowd is but a blur and then altogether cut out of the scene. The reader is included in a dialogue that is personal and intimate. This moment illustrates that physical proximity does not entail emotional connection. Though Cheryl and Anders are in the same room during her chemotherapy, the illness stands in the way of their relationship, but when this issue no longer exists, the couple reestablishes a bond that supersedes physical presence. From these stationary moments in the hospital juxtaposed with Cheryl’s funeral, when Anders must “move on”, the novel’s theme of travel is formed. The beginning depicts multiple travel scenarios gone awry. From comical catastrophes on a camping trip to a car accident which leaves them stranded in a motel over Christmas, Anders and Cheryl maintain a happy disposition through each trial they experience. This account is meant to honor these simple times, these literal and figurative journeys. Despite the many misfortunes that befall them, be it as simple as a chip-stealing raccoon or as complex as a debilitating disease, Anders and Cheryl remain together and in love. This idea continues throughout the last chapter: “Postcards from him to her”. Paralleling the novel’s beginning, “Postcards from her to him”, its ending is also the communication between this couple during a trip which physically separates them. This obstacle does not interfere with their relationship, though, and physical distance—however it is measured—seems to be just another mishap that they are ultimately able to happily overcome. The two covers are bookended with a Polaroid picture: the first of the couple smiling goofily; the second of them kissing. Surrounding these Polaroids are orangish-green leaved trees. Just as these pictures allow the reader into an intimate moment, the novel works in the same way. These images leave the reader not with the feeling of finalization, but with the notion that this is not, in fact, the end. Death does not signal the end to a story, but, like trees with leaves discolored, is merely a part of the cycle of life. 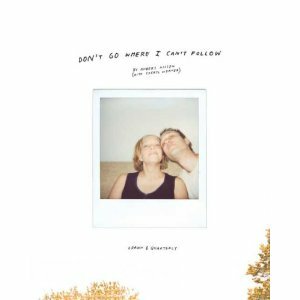 Don’t Go Where I Can’t Follow is a tender collection of letters, photographs, and drawings Anders Nilsen has compiled in memory of his fiancee, Cheryl Weaver, who died of cancer in November 2005. It is an appreciation of the time they shared together, and a heart-breaking account of the progression of her illness. From early love notes, simple and poetic postcards, and tales of their travels together in written and comics form, to Nilsen’s journal entries and drawings done in the hospital during her final days, and the beautifully rendered tear-jerking account of Weaver’s memorial, Don’t Go Where I Can’t Follow is a deeply personal romance, and a universal reminder of our mortality and the significance of the relationships we build.